Please provide business descriptions you would like to feature on the website. What kinds of businesses benefit from PWP Partner Business participation? We accept partners of all shapes and sizes. In addition to wineries, we feature hotels, restaurants, tour guides and driving services. If your business is not in one of those verticals, but you think it would be a good fit, don’t hesitate to reach out! 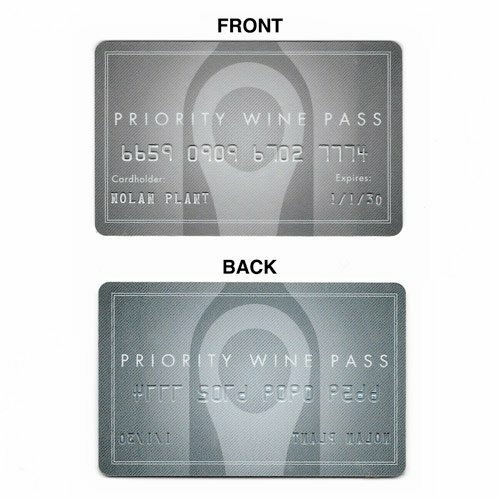 What does a Priority Wine Pass look like? The physical pass is the standard size and feel of a regular credit card. Please reference the image shown below. The digital version is a PDF which may be printed out or viewed on a visitors mobile device. Reference the image here. 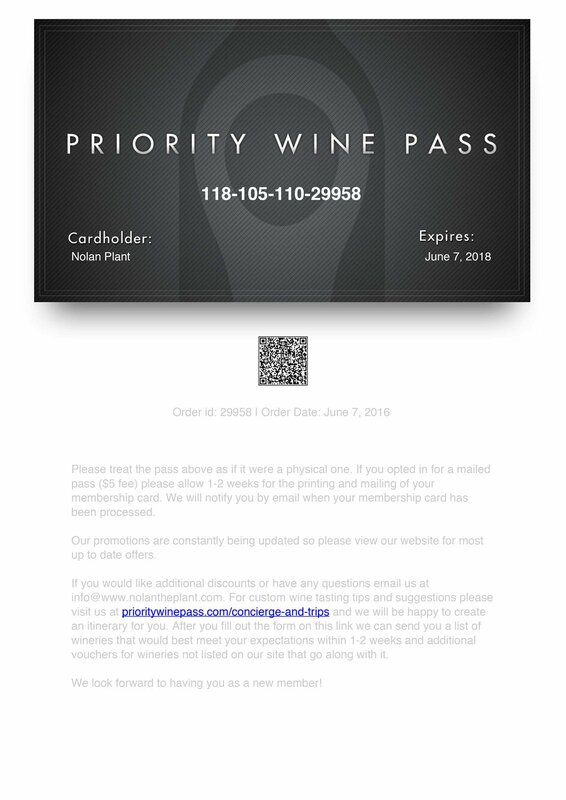 How do I check if a Priority Wine Pass is valid? Our passes are only valid for the cardholder whose name appears on the pass. Therefore we recommend that you ask the cardholder for a government-issued ID to reference. Also, note that the pass is invalid after the expiration date listed on the pass. What are the obligations of being a Priority Wine Pass Partner Business? We ask that you honor the offers that you list on our website. We also ask that you be straightforward regarding your deals and outline any restrictions that may apply. Lastly, we ask that you inform all your employees about the program and keep new hires up to date regarding your offers. How do the 2 for 1 tastings work? Our most popular winery offer is the 2 for 1 tastings. This essentially allows the cardholder to purchase 2 tasting for 50% off. If you decide to promote this offer we ask that you allow the cardholder share their 50% tasting with a guest. Can I change my offers whenever I want? Yes. However, we ask that you give us 90 days so that we can update and inform our customers accordingly. Can I cancel my partnership after I sign up? Yes. However, we ask that you give us 90 days notice to do so. We also ask that you continue to honor the offer within that 90 day period as to not confuse of let down any visiting customers. Can I promote events or specials through your channels? Yes! Keep us informed about any and all events or specials and we will do our best to promote to our members. Where can I find more info about Priority Wine Pass? We encourage you to browse our website for more information. The customer F.A.Q. is also a great resource for additional membership information. You can also reach us at info@prioritywinepass.com for partner results, success stories and any other questions you may have.